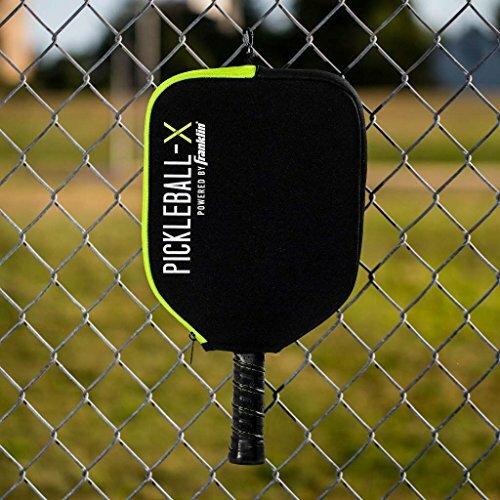 Are you looking to buy a pickleball paddle cover to protect that new paddle you just bought? If you spent your hard earned money on a new paddle, it’s worth investing in a quality cover to protect your investment and keep it from getting banged up. 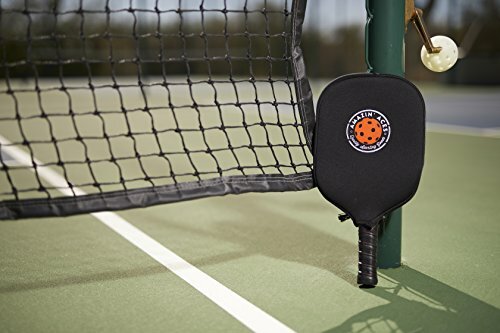 We’ve reviewed the options available on the market and chose this neoprene paddle cover as the winner but scroll down to see our other top picks for best pickleball paddle cover in 2019. The pitfall is that these covers don’t have a strap and they also leave the handle exposed. If you prefer a paddle case with a strap to put over your shoulder and/or want to protect the grip, we’ve suggested some good paddle cases here. If you carry more gear to the courts (like backup paddles, balls and a water bottle) you may want to consider a dedicated pickleball sling bag, backpack or duffle bag which we’ve reviewed here. There are some new ones on the market that even have special compartments to store your pickleball shoes and some with insulated storage to keep your drinks and snacks cold! Our choice for best paddle cover is this top-selling neoprene cover by Pickleball Central. The cover measures 9.5 x 12 inches and fits all paddles up to 8 1/4 inches wide so accommodates almost all standard and even wide paddles such as the popular Onix Z5 wide-body paddle and the popular Paddletek Bantam EX-L. The neoprene makes it long lasting and durable and the cushioning will protect the paddle edge from getting dinged or banged up and is also an easy surface to clean. If you’re looking for a simple, lightweight option to keep your paddle in good shape this paddle cover is an easy choice. 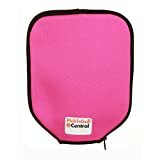 There are other similar neoprene covers out there but we really do not see any benefit over this one and given the reputation and customer service of Pickleball Central we don’t see any other options that beat this one. This neoprene case is sold in the following colors: gray with an orange accent stripe, royal blue with an orange accent stripe, lime with a black accent stripe or pink with a black accent stripe. It also now comes in this “Zero Zero Two” version – with large printed letters across the face- which is a cool option for anyone looking for a less subtle cover. The main difference is that the Amazin’ Aces logo taking up a pretty big chunk of the cover’s outer face. So while this may be great if you own the company’s paddles, some people may prefer the plain solid design of the neoprene cover we picked above. If you don’t really care about the large logo than this is a good budget option especially if you are in need of two covers. The design is similar to other covers on the market, its made of neoprene with a zipper that zips from one side to the top of the paddle. 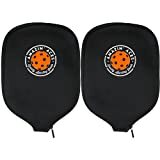 The cover measures 8.5″ x 12″ which is the right size for most standard sized pickleball paddles (it fits popular models including the Selkirk Pro S1C, ProLite Magnum and ProLite supernova). It will also fit Gamma wide bodied paddles and wider body paddles like the TOPP XJ-900 although those may stretch the fabric slightly to get it them in- which the cover is designed to do. This paddle cover is an inch longer than several other paddle covers we’ve seen, although since most standard paddles already fit the 12″ covers, the extra inch doesn’t seem like a real benefit. I actually think it protects the paddle a little better if the fit is somewhat snug- even if the neoprene has to stretch very slightly as it keeps the paddle from moving around inside. The cover is made by Pickleball-X (Franklin Sports). If you want to check out their other products you can see our full company profile here. The other key feature that they’ve added to this cover which I have not seen on other ones is a “fence clip”, a plastic clip at the top of the cover that allows you to clip it on to the typical chain link fence at a pickleball court. Click to see close up photos of the clip. Although it’s a novel idea, I personally don’t really see myself needed this. If it’s something you could see using than that could be worth the purchase as it’s the main feature that sets this cover apart from the others. This last option on this list is more of a novelty item or a gift for a pickleball player. The set includes a neoprene paddle case along with a pickleball themed bottle opener and key chain. The cover is a basic black neoprene, its solid black with the words “Eat, Sleep, Pickleball” in white lettering right above the opening for the handle. The accessories that come with are made of metal, decent quality compared to many plastic items we’ve seen. This seems like a decent cover is a choice if you are buying it as a gift or just want a decently priced cover with some free bonus items. 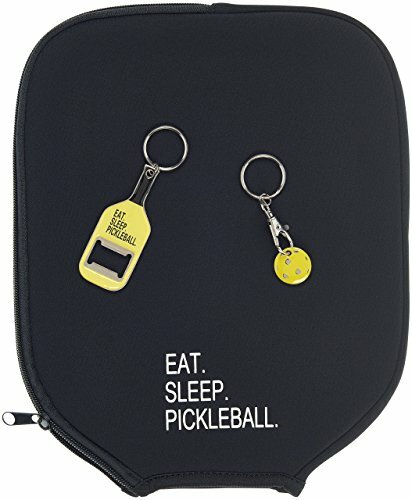 If you’re really looking for a pickleball keychain you may want to check out this short list of picks – as there are many on the market. Unfortunately, most paddles are sold individually so the covers are sold are sold separately. Luckily paddle covers are relatively inexpensive. Especially considering the cost of some of the new paddles on the market, we feel the small cost of the cover is worth protecting the paddle and reducing wear and tear. A cover is especially a good option if you have an edgeless paddle which is made without an edge guard and are more susceptible to edge damage. In that article, we explain the pros and cons to this paddle style and some top picks to consider. Even if your paddle does have an edge guard it’s still a good idea to keep it covered when not in use- to protect the paddle face.